With all of this extra noise it´s easy to understand how susceptible our ears have become to the dangerous effects of heightened sound. 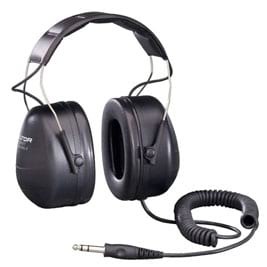 Whether operating an aircraft or working with heavy machinery our ears need the appropriate protection to withstand a noisy environment. 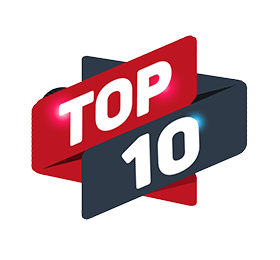 Here at Onedirect we´ve compiled a list of the top 10 ear defenders you´ll want to be investing in for 2019, take a look! 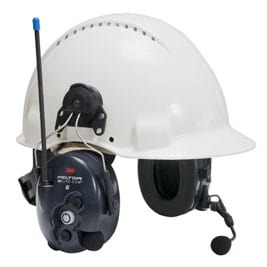 Starting off our list we have the 3M Peltor WS LiteCom Bluetooth for helmets. This device combines superb background noise filtering with Bluetooth capabilities. Officially serving as an ear defender, it comes with 8 channels, 121 sub-channels and VOX hands free. It will operate as a two-way radio and as a headset allowing you to communicate with other LiteCom devices within a 3km range. Furthermore with Bluetooth 2.0 connectivity you´ll be able to manage mobile calls from your radio and has a range of 10m. Protection is key with the 3M Peltor, however this doesn´t mean that comfort has been substituted. The device is fitted with high attenuating ear cups which provide quality ear comfort, giving you the required ear space needed. 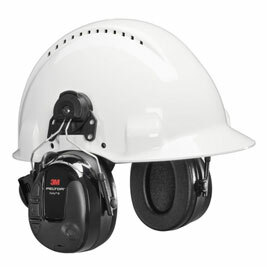 Along with high performing ear cups the 3M Peltor offers users a quick positioning microphone with PTT, filtering out unwanted noise. We´re particularly impressed by it´s high attenuation features, with the ability to prevent noise exceeding that of 33dB. 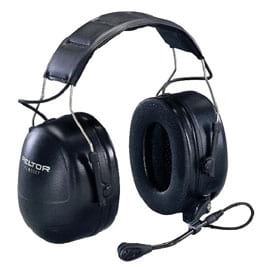 Ranking at third place we have the Peltor Listen Only Stereo 3.5mm Headset. It comes with soft, widely spaced and foam filled ear cushions with wires made from stainless steel to evenly distribute pressure through the user´s ears. Furthermore it comes with 0.75 -1.4m of spiral cord with a connector to an Ex-approved radio, meaning that you´ll only be receiving the most high quality, sufficient care for your ears. 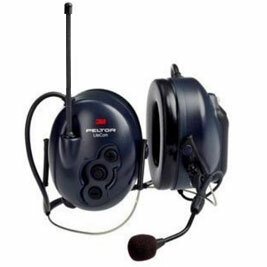 The 3M Peltor LiteCom Two-Way Radio Headset functions just as a two-way radio would. It includes 8 channels, 38 sub-channels and VOX hands free, giving you the variety you need in a multi-purpose environment. As it is optimised for an environment which facilitates a high degree of noise this ear defender can itself communicate with devices in the area which operate on the same frequency. Interestingly this device can open your chosen channel upon immediate usage, allowing the noise cancelling microphone to filter out noise in your environment in the process. This ultra-high attenuation device comes with optimised acoustic design and perfect space for your ears providing the best quality of sound and optimal comfort. Although not VOX enabled, this device is well optimised for industrial areas and construction sites. It is able to be connected to two-way radios, cordless DECT phones and mobile phone. This device comes with high attenuating ear cushions which have been perfectly designed to provide the right amount of space for your ears whilst not taking away from quality of sound. PTT is offered also, and can be activated on the left ear cushion. Combining a powerful noise cancelling technology with Bluetooth technology the 3M Peltor WS ProTac XP Ear Defender delivers potent protection against damaging noise whilst simultaneously allowing you access to worldly technology. Protecting against such noise the device will leave you safe against noise above 85dB, including gun shots. Interactive ear cushions will monitor any noise in your surroundings, ensuring that any noise filtering through is of a safe level. In addition it´s flexible; you can connect this to an external radio this headset. Perhaps the greatest quality of the Tactical XP Standard is it´s customibility. As with the ProTac you have the chance to adjust the volume of the device with the active-volume ability: However what makes the difference between the two is the fact that with the Tactical XP Standard you can also adjust the balance. This makes this device a game-changer for users with partial hearing loss. From everything we can see the the 3M Peltor ProTac III keeps employees safe from dangerous noise levels in any environment. With the ability to reduce wayward, dangerous noise levels to a perfectly safe 82dB this ear defender provides some of the most reliable results of any ear defender. Staying connected won´t be a problem either, as you receive a 3.5mm jack socket allowing you to connect to your mobile device freely whilst simultaneously receiving radio signal into your ear cushions. 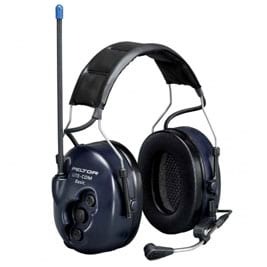 Complete with a boom microphone this ear defender comes with Bluetooth, A2DP streaming and FM Radio meaning that you´ll be able to listen to music whilst simultaneously being protected from dangerous noise. Furthermore it comes with an active listening feature, which allows you to listen to very low frequency sounds and blocking out the louder sounds typically found near industrial areas. These ear defenders are also optimised for Bluetooth and allow you to accept or reject calls. 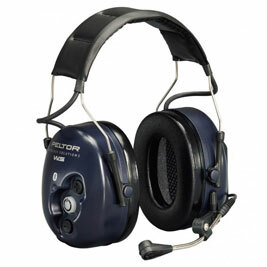 Finally, we have the 3M Peltor LiteCom (neckband version). 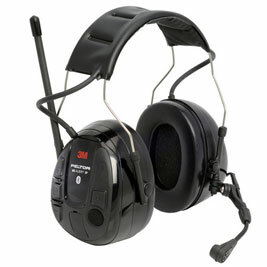 This intuitive ear defender has a built-in PMR446 radio with PTT. Including 8 channels, 38 sub channels and VOX hands free lending it all the features of a two-way radio. Furthermore it comes with an impressive battery life of 20 hours and a 3000m range, rendering this ear defender an exceptional choice for your company. We´re particularly impressed by its energy-saving qualities, as this headset is optimised to switch off after 2 hours of inactivity, meaning that you´ll be conserving energy without having to worry about wastage.